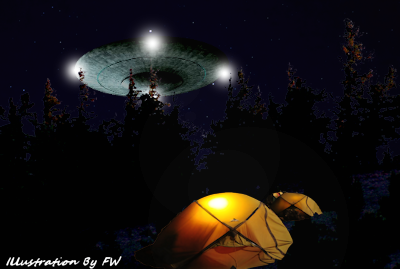 A New Mexico witness near Cimarron recalled a UFO event from 1978 when a disc-shaped object hovered 25 feet off of the ground with four glowing, round lights, according to testimony in Case 63904 from the Mutual UFO Network (MUFON) witness reporting database. The events took place at Miners Camp, Philmont Scout Ranch, in Cimarron, on the night of July 4, 2008. The witness woke up about midnight and observed the object near his tent about 50 feet away. “It had four round, glowing globes spaced at 12 o’clock, 3 o’clock, 6 o’clock and 9 o’clock. . . ."